Val's Quilting Studio : What Dog Breed are You?? I'm reminded I took this picture for a story quilt I wanted to create. I should do that! I took the quiz three times. I'm a confirmed #2:"Easy Going Playmate"...which is the terrier group! That makes so much sense as Jackson is my "best friend" . As you already know, he is my empty nest angel/life saver/happy companion. LOL! 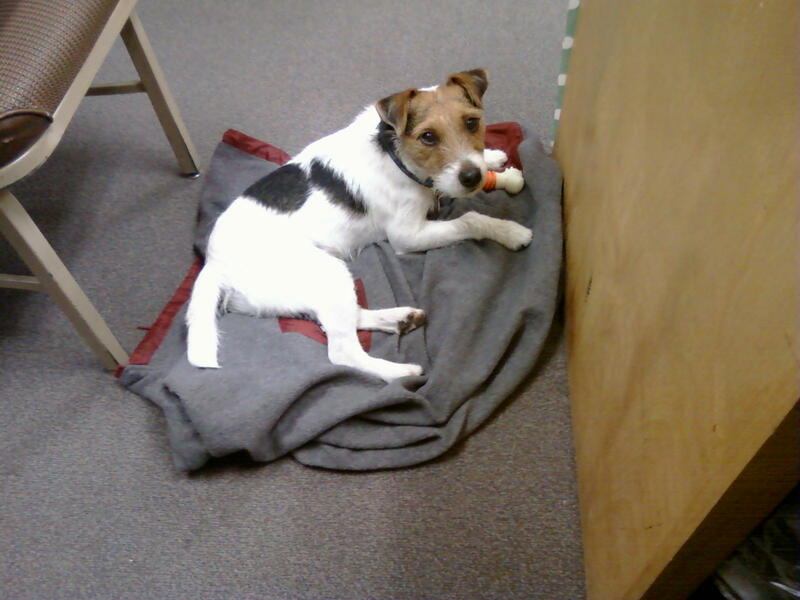 But I would be heartbroken if a reader ran out and adopted a Jack Russell just because they like Jackson. Jackson at work with me on a teacher work day. He always uses by jacket as his blanket. We haven't always had a Jack Russell/Terrier and after finding PuppySpot I was inspired to write this post. In review of their site, I'm appreciative of the work they have done to develop a resource that helps one find the "right" puppy for their homes and not make the mistakes I have made in dog ownership in the past. I'm a strong advocate for finding the right dog for the right home. Pet ownership is a responsibility. I've witnessed JRT with the wrong owners. They end up neglected and/or in shelters. Yet, this can be avoided. I sooo enjoy and appreciate that Jackson has become a highlight on my blog and that you all love him too. But it's important we all make the effort to find the "right" pet for ourselves. Admittedly, I've made my share of uneducated, mismatched choices over the past 28 years. Pebbles, that adorable little Yorkie: So cute and playful. But with two toddler daughters, fifteen months apart, this was like having a third child. Unfortunately, she ran into the street and got struck by a car. I was devastated and felt I had failed as a dog owner. I should have never let her loose to play unsupervised with the girls. We also had a Papillon. This was that situation where your friend just had a litter and you can get this cute puppy for free! The girls begged: "oh it's so cute". Well, puppy grows up. She kept running away from the girls. She was scared of everything, especially the girls! I finally found her a home with a house-bound woman and they each became one another's "Loyal, Lap, Companion". This is a #1 category breed and not a dog for a home with toddlers. I write this post to share the valuable resource PuppySpot has to offer if you are ever looking for a puppy. I have always had a dog. I grew up with my own dog. (A little terrier I named Cindy) PuppySpot has a variety of puppies just waiting for a home, including, Jack Russells. Take the quiz and find the right dog for you and your lifestyle. I understand the terrier breed and even moments like this: (YES! This is where my puzzle ended. Notice the little bowl on the couch.) I understand he's just feeling as housebound as me during this harsh Winter. Even him trying to "make up to me" as I collected floor pieces only made me love him more! PuppySpot uses a personalized approach that caters to the needs of those in search of a new furry friend as well as the breeders who are looking for their puppies' forever homes. PuppySpot is a service committed to helping responsible breeders place their puppies with caring individuals and families. But, more than just a service, PuppySpot is a community of dog lovers whose mission is to make lives better by placing healthy puppies into happy homes. I want to dedicate this post to our first dog CJ, a Labrador Retriever. As a young growing family, having a dog that then fit into #3 "The Active Socialite" category was perfect. She was a rescue dog who who we wanted to retrain. We had a house. I especially didn't mind that she barked when anyone came to the house. She was protective, and active with us. She lived a long life with us. She was the dog our girls grew up with. She finally passed away from old age and Cushing's Disease. When she passed, we lost a family member. Thanks for stopping by today. I hope if you are looking for a puppy or know anyone who is, that you will share this quiz and resource with them. 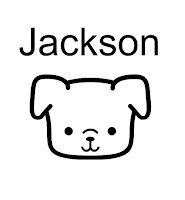 They make it possible for everyone to find and enjoy the life-long companionship of "their own" Jackson. Jackson wants me to end with a Give-Away! Give-Away will close on January 31st. Love Jackson - he is absolutely the cutest dog! We, unfortunately, don't have a dog.. we share our home with three cats... but we are dog people too!! I am a 2, although a 1 sounds appealing these days. I think you know I used to have a Jack Russell. He was well-behaved, but easily distracted & kept everyone on their toes. He would 'rebel' if I came home from work, then left again for any short length of time. Almost immediately he would begin shredding TP. Sure miss him. My mother's companion is a sweet Border Terrier. Still active, but a bit more mellow than the JR. Thanks for the fun post & weblink! I took the quiz twice because we have a house with a yard, but also easy access to a park. So I came out both a 2 and a 3. Which is no surprise at all. Sam is a terrior mix...a Shelter Special, we like to say. 20 pounds of get up and go, but also content to just hang out. He just wants to be where we are. :) He's my special boy. This is so important as too many people do pick the wrong type dog. My mother is afraid of dogs, so we had none growing up. I got my English/Aussie Sheppare/Sheltie mix (interesting) in my early 20's and trained/used as a working dog (cattle), loved to go hunting with my Dad, and traveled with me when I was showing my horses. He even brightened my kid's early lives as he had a very long life - passed just before his 19th B'day. Since then I have had cats. I'm a number 2 as well. I grew up with a beagle, raised my children with a lab, and shared our empty nest with a wheaten. It all makes sense! Fun post. a good idea for somene wanting a dog but not for me, as I have got older I have become more frightened of dogs and now avoid them silly but that is how it is with me. I'm a number 2... and I did have a golden retriever. We had to put him down 2 years ago. He was 15 years old. We loved him. I clicked on the link, but saw nothing about a quiz anywhere. I have one from each of the categories and adore them all, not sure what that says about me? LOL I love these puppy stories, thanks for sharing! I am a number 2. I have a bichon frisée, a super fun small breed dog with big personality. She is a senior citizen now, and people ask if I will get another dog when she is gone. Looking at this chart, I might consider a number 1 breed, as I would like one that would spend more time on my lap! I fell into the Terrier breed category also. But then I have always been a terrier person. Growing up we had a border collie, schnauzer, Braird terrier, Boston terrier, and a JRT mix. My first dog, on my own as an adult, was a West Highland White terrier. He passed away 8 years ago but I still miss him (as I miss the family dogs that we have loved and lost). After Bogart died my husband and I rescued a Cockapoo that had been abused. She was with us for almost 8 years before she died and I think she was able to get over most of her terrors in that time. It's funny, thinking about it now I base my memories on my dogs. . . .which is a good thing, I think. Hugs to Jackson! Sorry to hear about your puzzle. I'm paired with a labrador which is fortunate since that is what I have... a six month old yellow boy. We've owned a golden retriever, two black labradors and a cocker spaniel in the past... love our sporting dogs. I'm a #2 also, but I think a Terrier would be too active for us. We had a Golden Retriever/German Shepherd mix when the kids were little. She was the perfect companion for them and their antics, and protected them when they were outside. When she passed we all missed her so much. Our next dog was an Australian Shepherd mix (we never knew with what) and so much fun. We really can't have a dog in this house.... to small, and can't afford the extra expenses of having a dog. I'll just admire Jackson from afar, if you don't mind. I'm somewhere between a 2 and a 3 as I could go either way on some questions. I adopted a shelter dog in September--we aren't sure what breed mix she is, but Kylie is definitely sweet and lovable! Such a great post! I am in the same category with you! We don't have a dog right now as life is pretty busy. We get to dog-sit the grand-pups often so that gives us our dog fix. My husband is very active at our local shelter and our kids have adopted shelter dogs which, as you know, is a gamble on what you are really getting. They do become part of the family and I am so happy our kids had many years with the most beautiful Bernese Mountain Dog. I don't have a dog right now, but I've long wanted a greyhound--according to the quiz, it would be a perfect fit! My allergies don't allow us to keep pets, much to Drama Teen's dismay. She volunteers at a local shelter where she plays with the cats a couple of nights a week. I'm a number two. I think this a good profile for me. I currently have a maltipoo, she's adorable and friendly, loves people but doesn't like dogs. She was a lap dog when she was little. My mom had dachshunds but they were always outside dogs, which was a shame because they were just adorable. My first dog was a Chesapeake Retriever who we rescued from an abusive owner. He was so good with my then 7-month-old daughter. Our next dog, who proceeded our maltipoo was a cockapoo. Love the -poo mixes. She was loveable, adorable and sweet. I cried my eyes out when she died and cried whenever I saw another cockapoo that looked like her. Sorry about your puzzle. My maltipoo did the same with one of our puzzles by eating the picture part and leaving the cardboard.